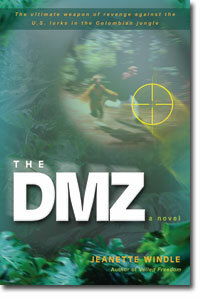 The DMZ is a political thriller set in the jungles of Columbia. After three U.S. missions fail and the whereabouts of the participants unknown, the media is informed and attack the story from all sides. Feeling pressure from the media and public outcry's the Colombian officials have no choice but to clear their names in the matter and invite a contingency, made up of doctors, reporters, cameramen and politicians, down to investigate. Julie Baker begs her editor to send her on this mission, even though she is green and has many ghosts from her past to deal with. When Julie was a child, her parents were missionaries in the Columbian jungle and while she was away at school, her parents died, leaving Julie with many angry questions at God and the people her parents deemed worthy to "save". However, this mission isn't what it appears to be when Julie comes to realize that some people aren't who they are, everyone has a mission but is everyone's mission for or against the United States government. After slipping out of camp, she makes her way to the village of her past and is confronted by the villagers who take Julie to the graves of her parents. It is here that Julie begins her healing however, before she can thank the villagers, things turn for the worse when she is kidnapped by the guerillas. Along the journey we uncover the secrets being hidden under the thick jungle canopy, the traitors and the political machinations that surrounds it all. We watch as Julie grows in spirit and strength to right the injustices that occurred and with an unexpected friend, they both join forces with the tribes of the jungle to stop the destruction that is about to occur. I found the main characters were believably written and the back story was enough to keep you focused on the surroundings in that they both tied into one another. The survival techniques dispersed throughout the pages was interesting to note, I would never have thought of tying huge banana leaves around my feet to stop them from blistering. I wasn't really impressed with the antagonists in the story, they lacked any real life and I felt the author rushed past them without given them much depth. I guess the "write-what-you-know" terminology would fit here, it is easier to write about the Colombian jungle and missionary life if you have experienced it, as Jeanette Windle has in growing up under the canopy. I liked the references to God throughout the pages without being too preachy, Julie's spiritual struggle was well-written. If you enjoy political thrillers, then The DMZ is a book you won't want to miss~!! "Those who are not willing to bleed and die for what they hold dear will always be held hostage by those who are." More than a decade after the end of the cold war has chilled the Marxist rebel movements around the world, one hot spot remains--Colombia. The inexplicable loss of three major U. S. assets draws the attention of the world to the Colombian demilitarized zone. Are the local Colombian rebels responsible? Or is a deadly Middle Eastern secret cloaked by the jungle canopy of the DMZ? Among the contingent of politicians and media headed for the DMZ seeking answers is reporter Julie Baker, whose parents had been missionaries in Colombia. Old hurts and terrors surge as she revisits the place of her birth--and her parents' deaths. When Julie's own abduction by guerrillas triggers a time bomb that has been ticking under the feet of the U. S. for a decade, she is left with more quesitons than answers. With the fate of two countries resting in her hands, Julie must put aside her own terror to face just what God's call for self-sacrifice will mean for her past and her increasingly uncertain future.